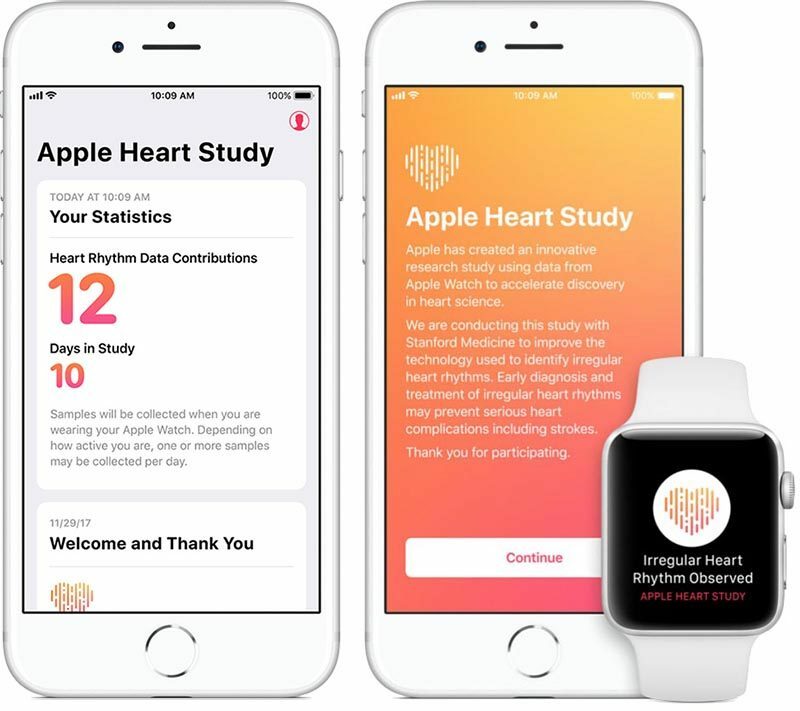 Stanford Medicine has published more details about the future of the Heart Study program it conducted in partnership with Apple, in which it attempted to reliably detect atrial fibrillation in Apple Watch wearers. The condition, which is characterized by an irregular heartbeat, often remains hidden because many people don't experience symptoms. Atrial fibrillation can increase the risk of stroke and heart failure. According to Stanford, the study involved 400,000 participants, making it the the largest screening program for atrial fibrillation ever conducted. A paper has also been published in the American Heart Journal describing the unique design of the clinical trial. Enrollment began in late 2017 and closed in August. Although some participants were informed in September that their participation in the study was complete, Stanford says it will continue to collect and collate data until early next year, which is consistent with Apple's original announcement. "We hope this study will help us better understand how wearable technologies can inform precision health," said Lloyd Minor, MD, dean of the School of Medicine. "These new tools, which have the potential to predict, prevent and manage disease, are finally within our reach." The FDA cleared two Apple Watch medical apps in September. One app uses data from the Apple Watch Series 4 to take an ECG by touching the button on the side of the device. The second app uses data from an optical sensor available on the Apple Watch Series 1 and later to analyze pulse data and identify irregular heart rhythms indicating atrial fibrillation. The Apple-Stanford Heart Study used the second app. Each year in the United States alone, atrial fibrillation results in 130,000 deaths and 750,000 hospitalizations, according to the Centers for Disease Control and Prevention. The CDC estimates that the condition affects between 2.7 million and 6.1 million people. In addition, another 700,000 people may have undiagnosed atrial fibrillation. Even though cardiology isn’t my field, it will be very interesting to see the first data analysis. [doublepost=1541159489][/doublepost]Far from being a niche product, the AW’s health monitoring potential is seismic. Blood glucose monitoring would be the next hurdle and game-changer. This has been pitched as a health and fitness device since the Series 2 debuted. The original watch was the only one that was really mainly focused on the fashion side. They changed course since then and now the main thing they pitch is health and fitness. Elevated heart rate notifications, EKG, fall detection, closing your rings: these are the main things they talk about when discussing the watch. It still has some fashion in it with the different casings and bands, but all of the functions of the watch are still present in all casing options. 1. Using the optical sensor (perhaps an improved version) to monitor blood oxygen saturation. 2. Continuous body temperature monitoring. Your watch could know that your "normal" body temperature is 98.2 in the morning and 98.9 in the afternoon or whatever. You'd have months/years of data to say, okay, my temp is 0.4 above normal right now, perhaps I should go to bed earlier so that when I am sick in the morning, I'll be well rested. While in many controlled cases these are done (e.g. hospitals) I don't believe there have been any long term studies of large groups (e.g. 400,000 people!) where this data is collected. You might see a slight spike (e.g. a tenth of a degree) in temperature a day or two before a cold or flu hits. Or you might see a drop in oxygen sat level by 1% or 2% days before pneumonia is visible on an x-ray. With half a million people, this type of information could become visible in the data and could then be used going forward. There are many other uses where continuous data (or even 12-18 hours a day) monitoring can provide important information for doctors and consequently patients. One hopes the FDA (and equivalent agencies around the world) don't stand in the way of out-of-the-box uses. That is a massive study. You can tell Apple are taking this seriously. I’ve only had my Apple Watch for less than a fortnight and I can already tell how often I’ll be using it. Of course they would. Just think of the sales boon if these were recommended by doctors and covered by health insurance/government healthcare around the world. Perhaps make a much more advanced $50,000 model for use in hospitals for patient monitoring and diagnostics.